Many insurances accepted including Quartz, Dean Health Plan, Inc., and UnitedHealthCare insurance. Please call (920) 699-3500 if you have questions. 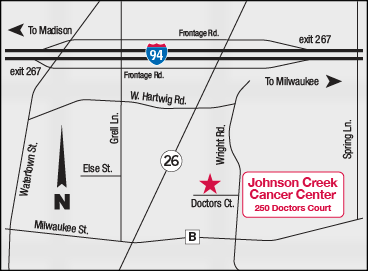 UW Cancer Center Johnson Creek offers the people of southeastern Wisconsin local access to leading-edge research and treatments offered by the University of Wisconsin Carbone Cancer Center in Madison. Virtually all types of cancer are treated at the Johnson Creek center, which offers medical and radiation oncology services, chemotherapy treatments and clinical trials. Expert physicians and a compassionate, attentive staff provide top-notch cancer care in a supportive, nurturing environment. UW Cancer Center Johnson Creek is a joint collaboration between Fort HealthCare, UW Health and Watertown Regional Medical Center. Both the building and its care philosophies are built upon the recognition that convenient and comprehensive cancer care is crucial to cancer patients and their families in southeastern Wisconsin.